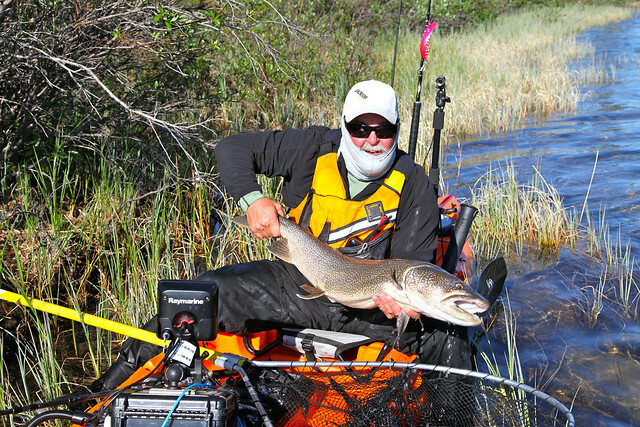 I have just returned from a great kayak fishing adventure to the Arctic Circle in the Northwest Territories, with Plummers Arctic Lodges. 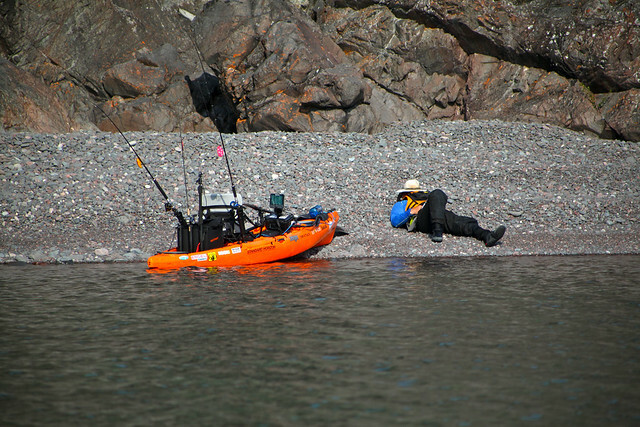 My friend Jeffrey Goudreau helped us set up the trip and was along as my guide and fishing companion. 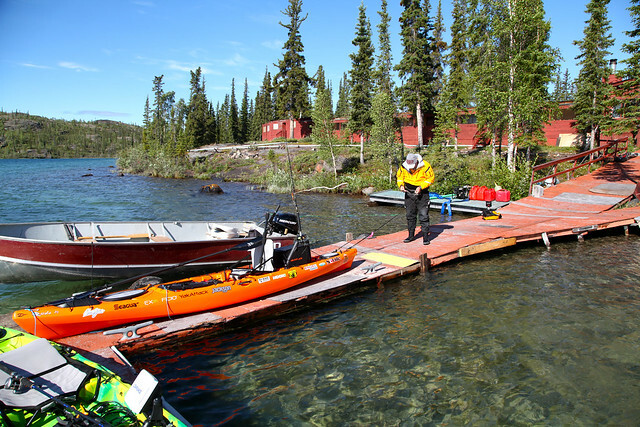 Plummers Arctic Lodges operates several fishing lodges in the NWT and they set us up at their Arctic Circle Lodge on Great Bear Lake. Besides Jeff and I, the only people at the lodge, or on this side of the lake for that matter, were my cameraman Will and the lodge manager Joel. We seriously saw no other signs for people for six days. 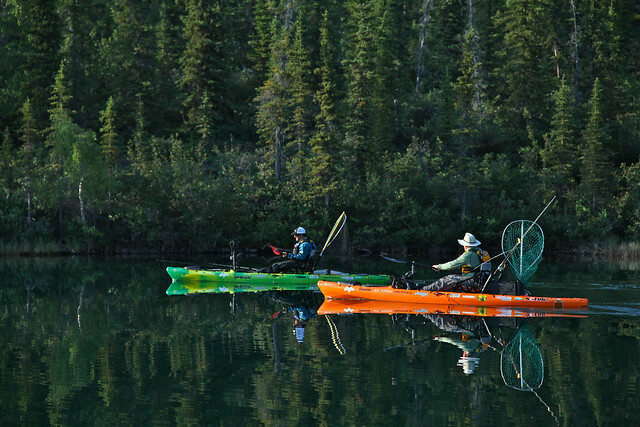 The location is pretty remote and we had to fly our kayaks in on the pontoons of a float plane. The fishing up here was just insane and with the crystal clear water you could easily spot fish down below or in the shallow flats. Having the Jackson Cuda 14’s made the extensive trolling we did easy and standing or just being in the high seat position made spotting the fish we were targeting a breeze. 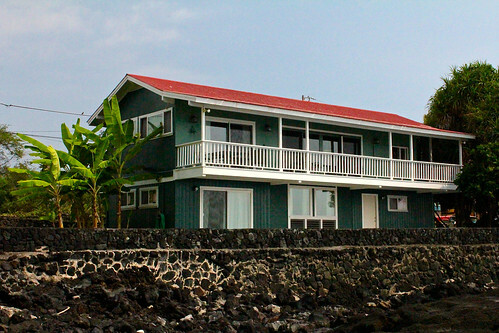 With our Maui Jim Sunglasses we could easily spot fish in the worst glare even when twenty feet down. When not pulling on fish this was just a great place to paddle and enjoy the scenery. 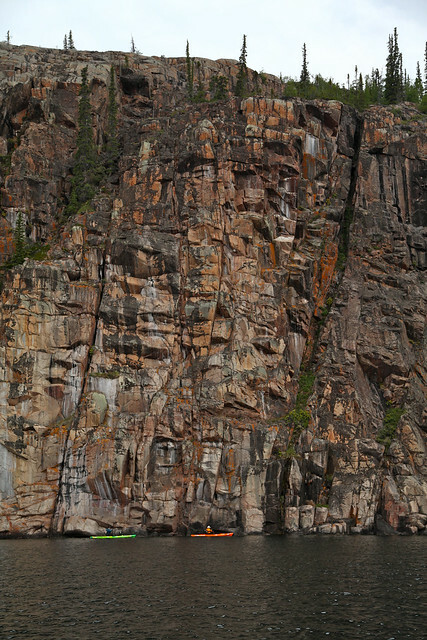 Big cliff or tiny kayaks? 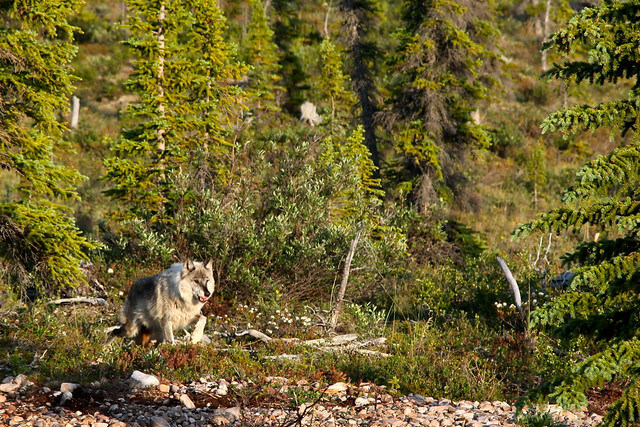 While paddling we also had encounters with a bit a wildlife including a couple Moose with calf’s, bald eagles and even a small pack of wolves. We had every kind of weather on the trip from very hot and buggy to rain and freezing winds, there were areas where the lake was still frozen so you can imagine how cold that water was. To be safe Jeff and I were always wearing dry gear from Kokatat with good wicking base layers from Exofficio. I went back and forth depending on the weather from my Kokatat bibs with Jacket when needed, to the full dry suit when we had the coldest days. The addition of some warm socks and my Body Glove booties even kept my toes warm. Having the right clothes like these from Kokatat, Body Glove and Exofficio made a huge difference in our comfort and safety on this trip. The ExOfficio neck gator was a life saver when it got real buggy too. If you are wondering about the hat, I lost my normal fishing hat during some real high winds. During the trip we honestly caught more fish than we could count mostly smaller fun sized fish when caught on the light bass rods and a few real good ones over twenty pounds. We really mixed up what we were tossing and trolling, Sebile Flat shads landed a lot of fish as well as big Husky spoons. When we had a time when the fish just wouldn’t commit to the big baits we would switch to small baits like the small flat shad or the Sebile Spin Shad. In fact Jeff caught our largest fish of the trip on a very small spin shad. If you look real close you can see the small Spin Shad in the fishes mouth. 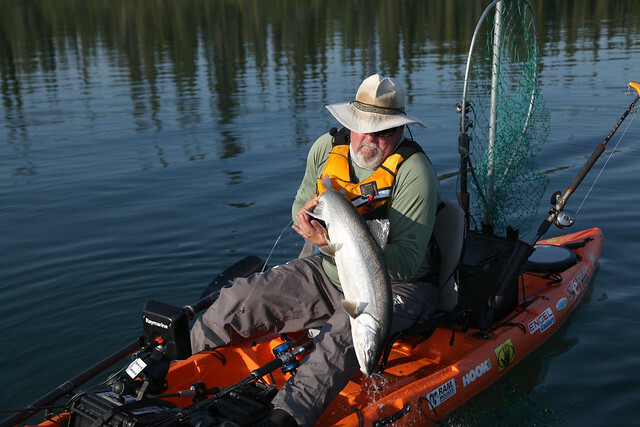 The go to rigs for the trip were reels loaded with fifty pound Seaguar Kanzen braid and a short top shot of 80-100- pound Seaguar Fluorocarbon leader, this made landing the fish much easier. I mentioned the high winds and losing my hat earlier, well good thing we had the Standard Horizon floating radios with us because when I tried to grab my hat I managed to knock my radio in the water too. Unlike my hat, it floated. Locating fish had a lot to do with water tempertures and edges of reefs in the lake, my Raymarine Dragonfly fish finder made things much easier. 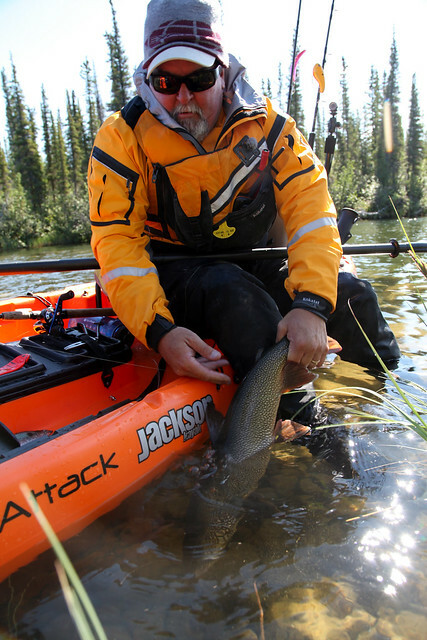 The Jackson Kayak Cuda comes rigged with Ram rod holders but I also like a few more storage spots and a place to carry tackle so I brought along a Yakattack Blackpak and it worked out very well on this trip. 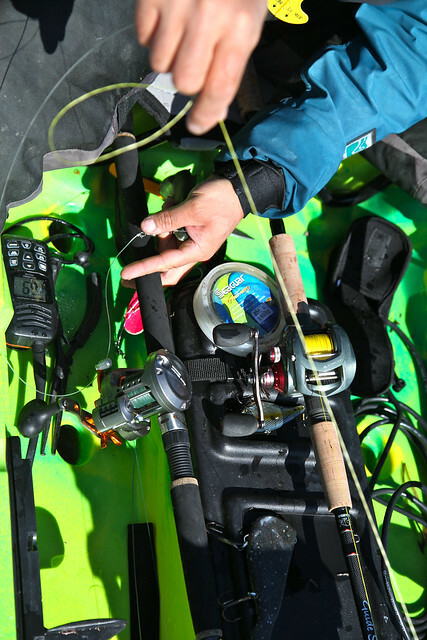 Another great tool we used on this trip was the Delorme Inreach which not only let us keep in touch with our families but allowed us to keep in touch with our shows fans letting you know what we were up to on our adventure through our twitter feed @kayakfishingTV. 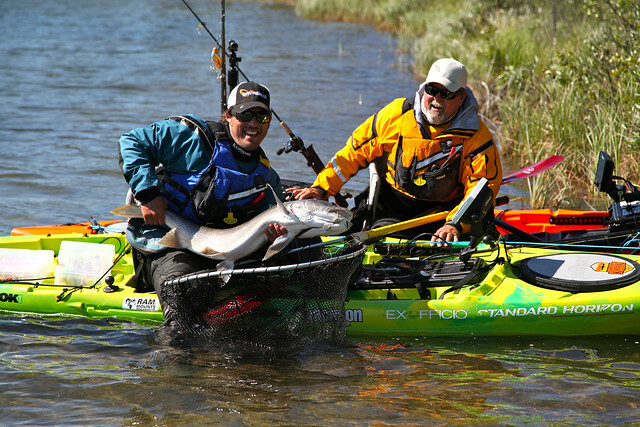 If you are going to do the amount of trolling we did on this trip you really want to have a good quality light weight paddle and I am so glad I have my Werner four piece Camano as it is just so easy to travel with and a dream to paddle with. With 24 hours of sun we sometimes found ourselves fishing well into the night without even realizing it until we were exhausted, luckily there were plenty of deserted beaches to take a nap on. This was an absolutely fantastic trip that I highly encourage anyone to do if they have the opportunity. We left a couple Jackson kayaks up there so you can use that as an excuse. Contact Plummers Arctic Lodges and they will set it all up for you. They practice barbless and all catch and release fishing up there so hopefully it will just keep getting better. We have just returned from our adventure in Uganda, fishing Lake Victoria and The Nile River. It was a long trip and a wonderful experience unlike any of our previous shoots. This one really was more about the location, people, and adventure than it was about the fish. Because it was such a long trip with multiple locations I am going to break down the trip into several reports on the blog. Before going into details of the trip itself I want to share with you some of the gear you may want and preparations you need if you are going to make a trip like this. First off, well before the trip you will want to contact our doctor or travel nurse to make sure you are up to date on all shots and pick up the meds that you will need on the trip. You will need a shot for Yellow fever and you must carry your proof of inoculation with you when entering the country. You will need to pick up anti-malarial meds and take them as prescribed, you do not want to get malaria. This is no joke, everyone we spoke with that spends a lot of time in this country has had malaria multiple times. Make sure you pick up some good bug repellent as well that contains Deet. The pharmacy at my doctors office recommended Ultrathon, seems like a good recommendation as I used it every day and never got a single bite on the trip. Wearing long sleeve shirts and pants in the evenings will help with avoiding those bites as well. Exofficio makes Bugs away clothing that repels the pesky critters and if you don’t go that route, Ultrathon makes gear and clothing spray which works very well. I used it on my hat to keep the bugs from swirling around my face. It is hot and humid in Uganda and the sun is brutal, you want to make sure you bring plenty of waterproof sunscreen and lightweight clothing, like you get from Exofficio, and drink plenty of bottled water. My favorite shirt for these conditions is the Exofficio Sol Cool, protection from the sun and does actually keep you cool. Don’t forget to bring a wide brimmed hat also to keep the sun off your head, face and ears. In these conditions you are also going to want good eye protection, I wear Maui Jim’s and would not trade them for anything. I always bring two pair, one with the HD lenses for the cloudy days and one with the darker lenses for the bright days. Of course MJ’s are not cheap so you don’t want to lose them that’s why I have Cablz Zipz on all my glasses to hold them on nice and snug and prevent sending them overboard. A trip to Africa may be a once in a lifetime experience and you don’t want to forget any of it so you will want to bring along a camera or two. My go to on the water camera is the Canon Powershot D20, besides being waterproof it has a built in GPS. The cool thing about that is that after the trip I can go back through the mapping software and see exactly where the shot was taken, which is a great way to relive the trip. Of course on a trip like this you never know what kind of gear and kayaks you will end up with so I always make sure I bring along some things to make my trip more enjoyable. First off I always travel with my own paddle, Werner makes a 4 piece carbon Camano that packs easily and is a joy to paddle. I also always bring my own PFD so I know I will be comfortable, my choice here is the ExtraSport ProCreeker. I also want to make sure that the kayak I will be using will have at least a couple rod holders on it and I have some tackle storage that is why I have mounted a couple Scotty Rocket Launcher rod holders to my Plano tackle box. 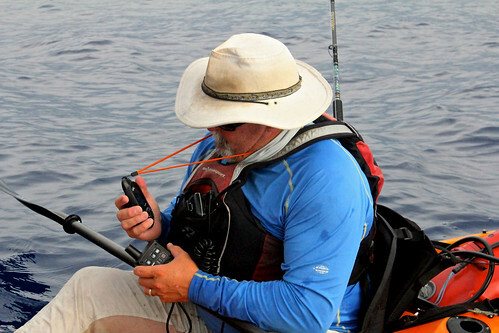 Whenever I am fishing a new location I find it very beneficial to have a fish finder on my kayak so I always bring my Humminbird portable, I just strap it to the deck of my Ocean Kayak and slap the suction cup transducer over the side and I am good to go. Of course if you are bringing electronics on a remote trip like this you will need a way to keep all your gear charged up. If staying at a hotel or lodge you will need to have a plug adaptor and power converter. 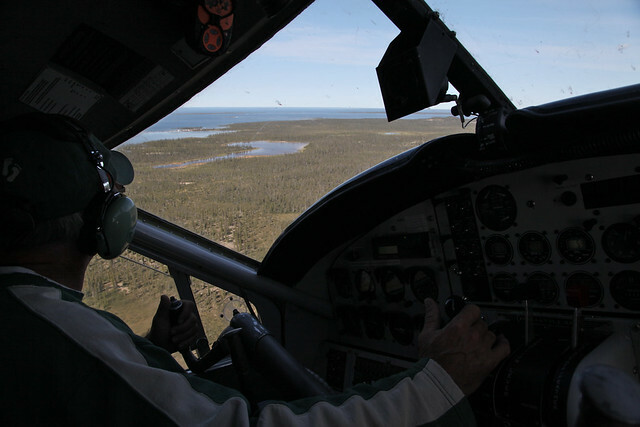 If you are going to be remote, as we were on parts of our trip you will need a different solution. What we have used for the past couple seasons while shooting remote are Goal Zero solar panels. For my 12v battery for my fish finder this year Goal Zero has come out with the Guardian with 12v volt controller. This thing was perfect for me, I could use it to recharge my battery at the end of the day. 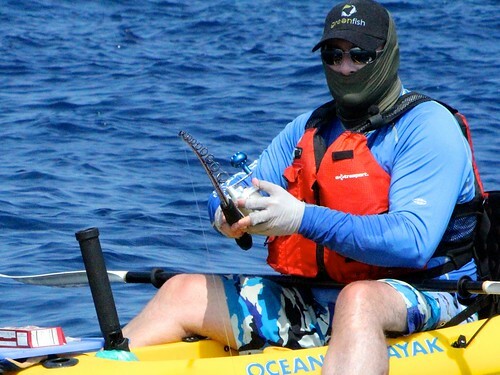 If we were having a particularly long day on the water I just strapped the solar panel to the bow of my kayak and hooked it directly to the battery this would keep my finder running all day long. 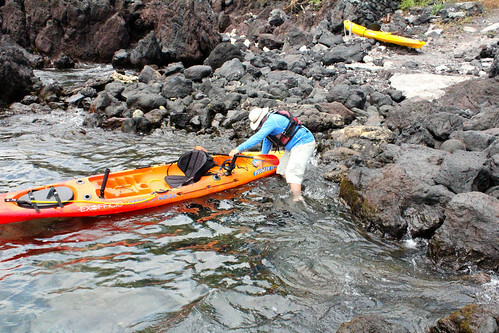 We did a lot of dragging kayaks up streams and rivers and the Body Glove 3-T shoes were perfect for all this rock hopping, never slipped on even the real slippery stuff. It was just like being barefoot but without trashing your feet on the sharp rocks. The shoes are quick draining and do a good job of keeping the rocks and sand out. The river is filled with sharp rocks and I lost a lot of lures so make sure you bring a good supply and a variety of styles and sizes. The lures I had the best luck with were the Sebile Koolie Minnow and the Sebile Flat Shad. The fish can really range in size so I would recommend bringing at least a few rods so you can address the different conditions and fish size. A nice low profile reel like the Abu Garcia Revo for tossing the light lures and something bigger like a Penn Torque for trolling the big Koolie Minnows. I loaded my reels with Seaguar Kanzen braid then had top shots of Seaguar Fluorocarbon from 12 to 60 pound test. 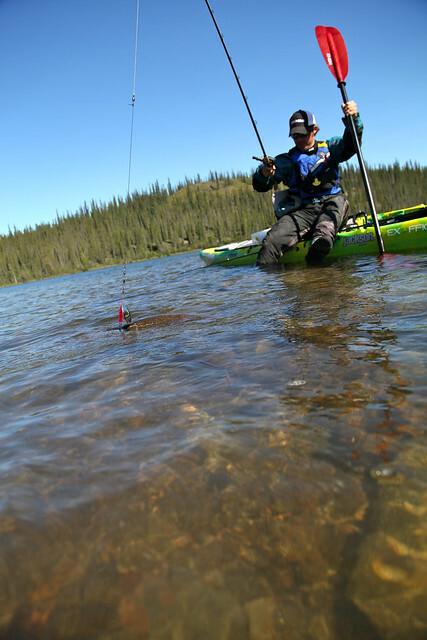 You will put in some long hot days on the water so it is not a bad idea to bring a small soft cooler to carry your snacks and plenty of cold water bottles. We brought the Engel coolers and they worked very well. Engel also make a drybag backpack which worked great for protecting all of our gear we needed to stay dry. A cool item that we started using last year on our trips that is even more important when on a true remote location like this is the Delorme GPS and InReach communicator. These great items not only kept you up to date on what we were doing but also allowed us to communicate with our families to let them know we were all OK or where to find us in an emergency. 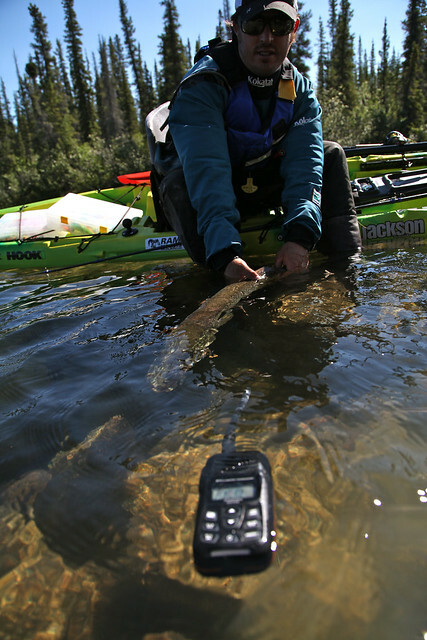 It is also a good idea to bring along your Standard Horizon VHF radios to communicate with your fishing partners and I never travel without my headlight for when I get stuck out in the dark. One last item that I really like that saves me on the long flights is my Exofficio Storm Logic vest, the thing that is so nice about it is that it rolls up into a neck pillow. This may seem like a small thing but with 40 hours of travel you will love having this thing. Likely the most important thing you can bring on this trip is your patience, things happen at their own pace over there and getting upset won’t help at all. You may want to bring along a few extra bucks to move things along though. At this time next week I will have finished about 24 hours of travel and will be with my good friend and fishing buddy Jeff Herman. We will be at our most remote location yet, Uganda in Africa. We will be hitting some rivers as well as Lake Victoria chasing, a new species for both of us, Nile Perch. 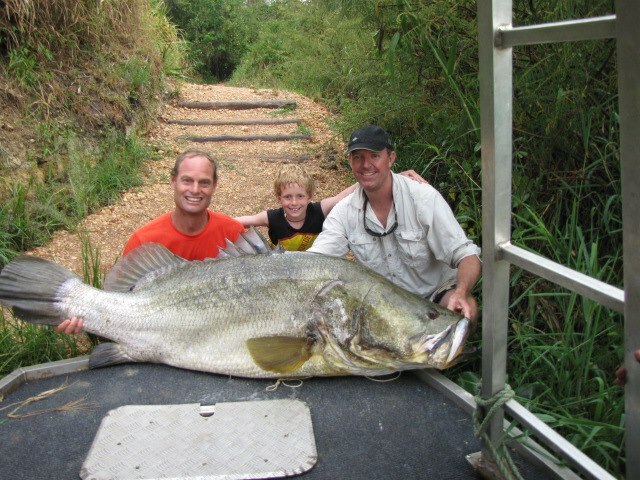 Here is a photo of a Nile Perch caught at one of the locations we will be visiting, just last week. 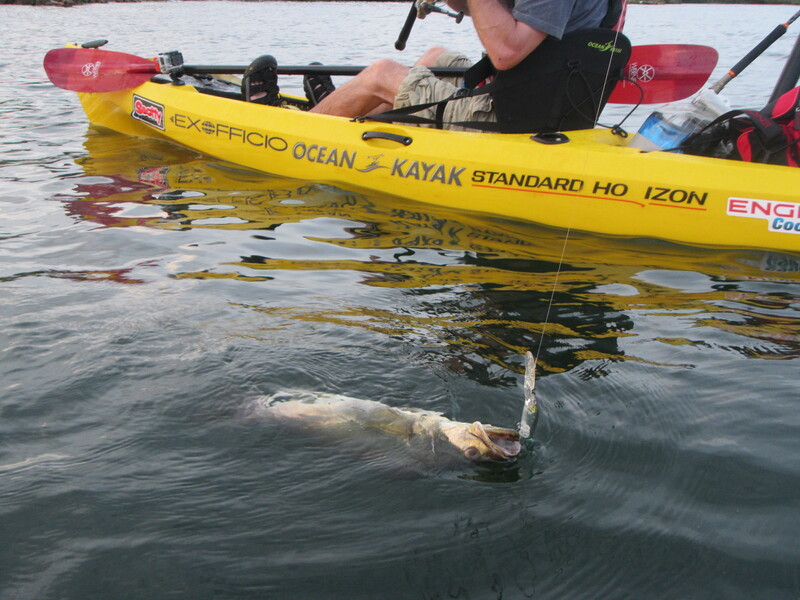 Don’t forget you can follow us on all of our adventures in real time with our on the spot updates on Twitter @KayakFishingTV and our Facebook page. 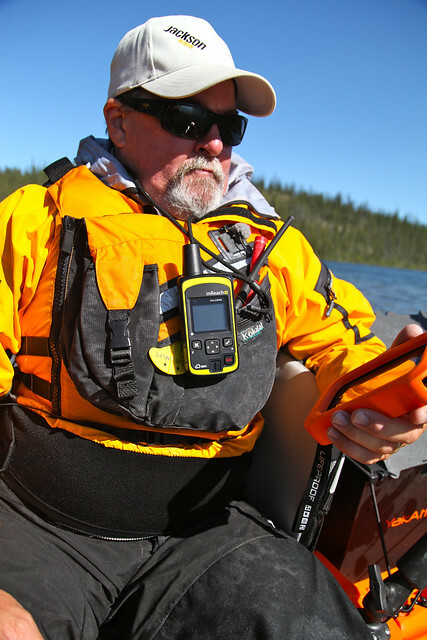 Delorme has set us up with a Delorme GPS and InReach 2 way communicator so you can not only follow our travels but also know exactly when we are getting on the fish. This is a remote trip, thankfully we are all set to keep our cameras and other electronics powered up with gear from Goal Zero. It is nice to know all we need is a sunny day to keep our equipment running. This is going to be a great adventure and I can’t wait to share it with you all. Last year we had the pleasure of fishing with Dan Joseph while up at Slippery Winds lodge in Canada and had a great time. This year Dan approached us with some ideas for another shoot and we jumped at the chance to fish with him again, and this time he was going to bring along his brother Manny. Their plan sounded just too good to pass on, the guys told us they had a spot where we could get some good numbers of big Musky and would follow it up with a secret lake loaded with big small mouth bass. How could we say no? Of course as always our trip was hampered by rain, so much so that we had a few days that we just couldn’t get out on the water, but on the days we did get out the fishing was fantastic. The first part of the trip was slated for a small section of the River Du Norde in La Chute Quebec. The great thing about this section of river is that it is rapid locked and there is no access to the section unless you run the small rapids or have property on the river. We stayed at the lovely Motel Eddy, which just so happens has access to the river. To say Motel Eddy was a one star motel would be a stretch but it was clean and on the river and that was all we needed. This limited access meant we had the stretch of river all to ourselves. I would guess that this section of the river was less than a mile long, but we would soon learn that it was holding plenty of the big fish we wanted. Jim rigging up, yes it was chilly, note the beany on my head. 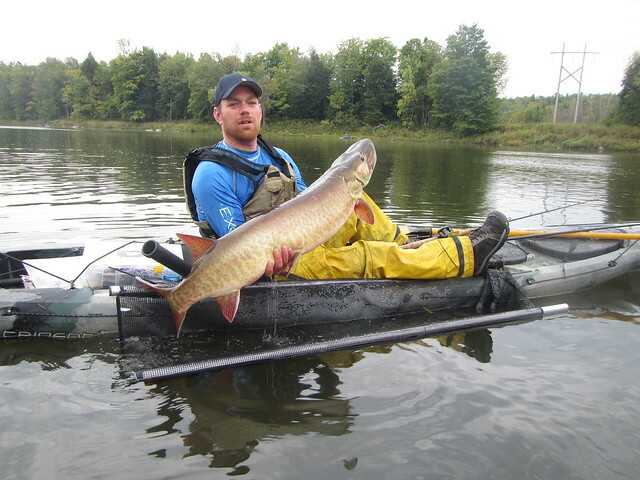 If you are familiar with Musky fishing you know that the guys that do it are lure fanatics. The lures they like are big, heavy and push a lot of water, to the point that we would cast up river and use the lures to pull us against the current. Because I knew what was in store for me I wanted to make sure I had the right rod and reel for the job of the endless casting we would be doing. 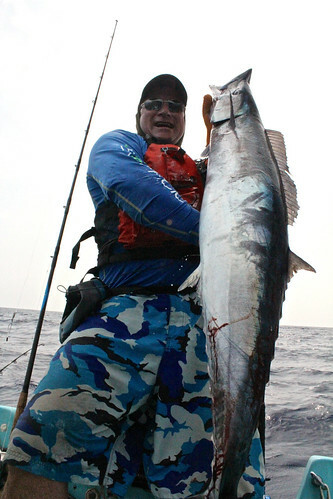 I contacted our friends at OKUMA Fishing to get their advice on a new setup for the trip. They pointed me to the Isis 400 bait caster and paired it with the new EVX Graphite Musky rod 9’3” in length. Now normally I would have to turn down a rod of that length because I just can’t travel with it but this rod collapses into itself down to just over 7 feet, and that fits in my rod tube just fine. I can’t tell you how happy I was to have gone with this set up. 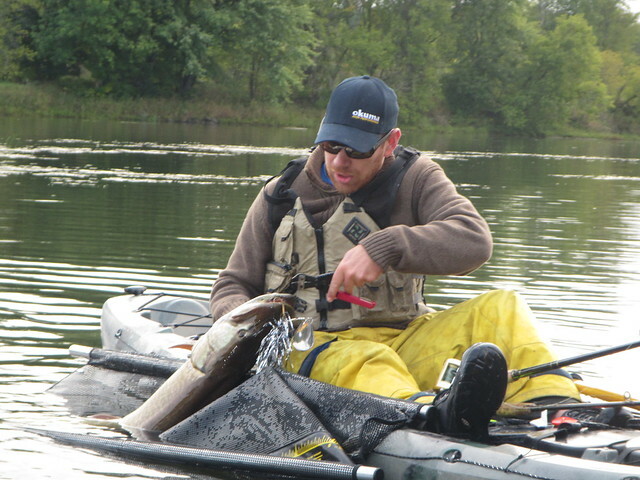 I could toss the big lures a mile with little strain on my body which meant I could do it all day long, and it had plenty of backbone to drive the big hooks home and get the fish to the kayak quickly. I can easily see using this rod for a lot more than musky, tossing lures for calico bass in the kelp or tarpon in Florida are in its future. Five minutes into our first day of fishing Manny broke the ice with a fat musky and maybe five minutes later I had a smaller one, which was the theme for me the first couple days. I caught plenty of fish but seemed to be keeping the small ones busy while Manny and Dan nailed the big ones. To add to my frustration one of the Musky I landed decided to fillet my thumb with his sharp gill rakes. Thankfully had I had some of the new Buff fishing gloves that I could wear for the remainder of the trip to protect my thumb from more damage. Our schedule during the trip was, get up early and get in some first light fishing for a few hours, head in for breakfast then do an afternoon/evening fishing session. It was a lot of time on the water but it was so worth it. 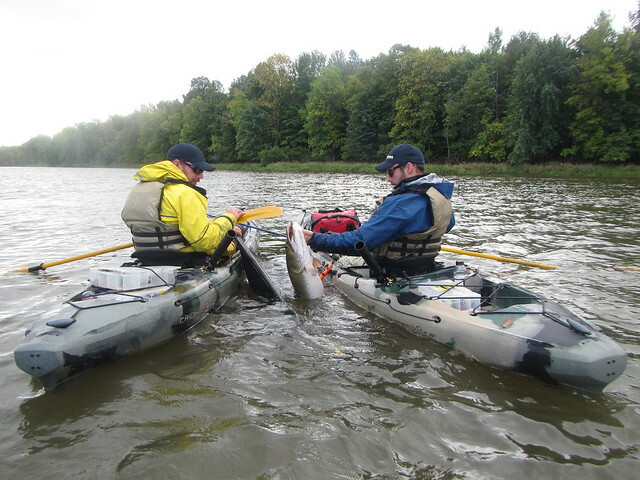 On our second day we hit a different section of river that would allow us to paddle and fish for several miles. The plan, to paddle and fish upriver for about four miles and fish and drift our way back. Once again Manny gets a fish within minutes of our start and I got one soon after. We thought this was the start to an epic day but other than these two fish we had only one other hit the rest of the day, and it came unbuttoned. We blamed the slow fishing on the overnight rain that had really dirtied up the water. Fish or no fish it was a great paddle along a gorgeous stretch of river. The next day we hit the small section of river once again and once again got some great fish but were only able to fish for a couple hours due to the downpour that kept us motel bound for the rest of the day. 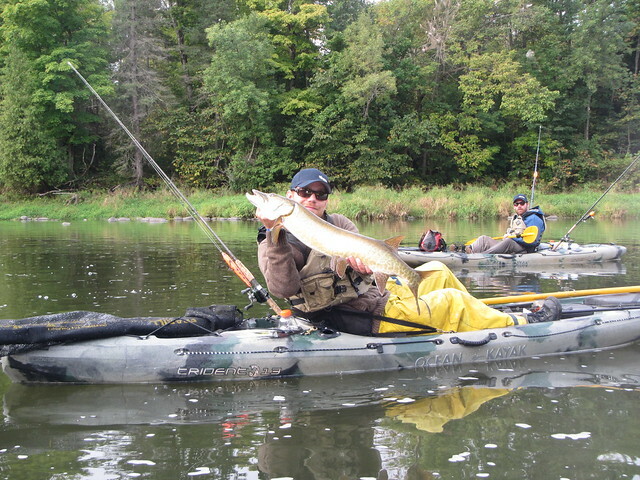 The last day on the river was one of the best, Dan got a real big musky and I sight casted to and landed a real nice pike. There is not much cooler than seeing a fish below the surface and tossing the right lure to it, in this case a Sebile Magic Swimmer, and watching him crush it. 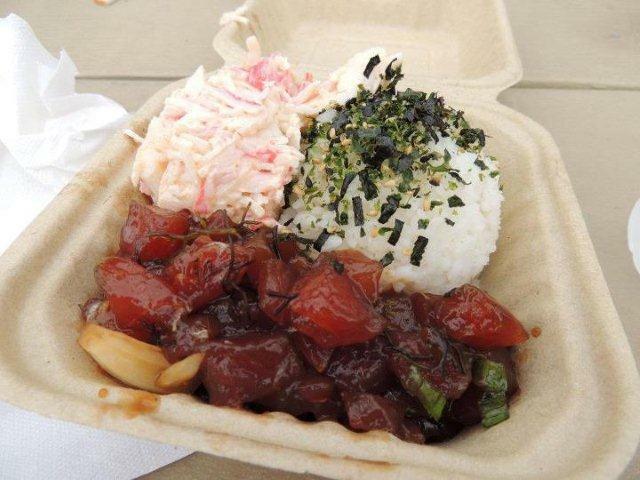 Thank god I had on my Maui Jim sunglasses so I could spot the fish. I also finally got my big Musky of the trip this time on a Sebile Splasher, alas we got no still photos of it as it managed to escape the cradle we were using to land the fish before we could get a shot. The Pike I sight casted to. As I mentioned the weather on this shoot was tough with a lot of rain, but we managed to get what we needed and had a great time. Thankfully to add to my comfort while on the trip in the cold conditions I had a new pair of Simms waders, I have been wearing waders on my kayak for a long time and I have to say, the quality of the Simms waders is beyond compare, it was great to be warm, dry and comfortable on my kayak even when the rain was coming down. To protect the stocking foot of the Simms waders I wear a neoprene water shoe from Body Glove. Good layers under those waders added to the comfort, the Exofficio Sol Cool shirts wick away moisture and their fleece Migrator shirt kept me warm, put a rain logic jacket on top and my entire body was warm and dry. My primary rod and reel setup for this part of the trip was the OKUMA EVX Graphite Musky Rod 9’3″ with an OKUMA Isis reel loaded with 30ld. Seaguar Kanzen Braid and a short 130lb. Seaguar fluorocarbon leader. Most of my fish were caught on the large Sebile Magic swimmer in red and white or the Sebile Spasher, all my hooks were swapped out for Mustad trebles. 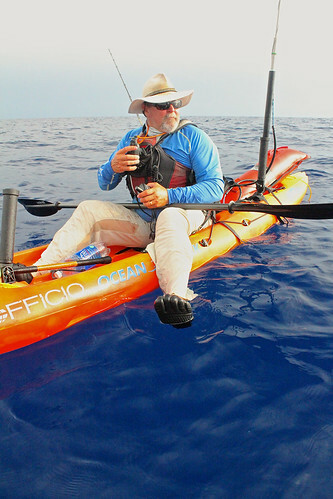 The kayaks we used on the trip were the Ocean Kayak Ultra 4.7 and the Trident 13s, all rigged up with Scotty Rod Holders. Most of the still shots were taken with the Canon Powershot D20 water proof camera and on board video was taken with the VIO POV camera. 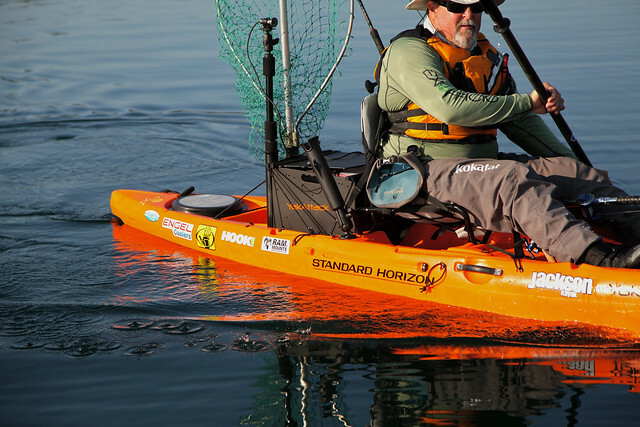 For most of the shoot I used a Humminbird portable fishfinder on my kayak which we kept powered up with a Goal Zero Nomad solar panel. 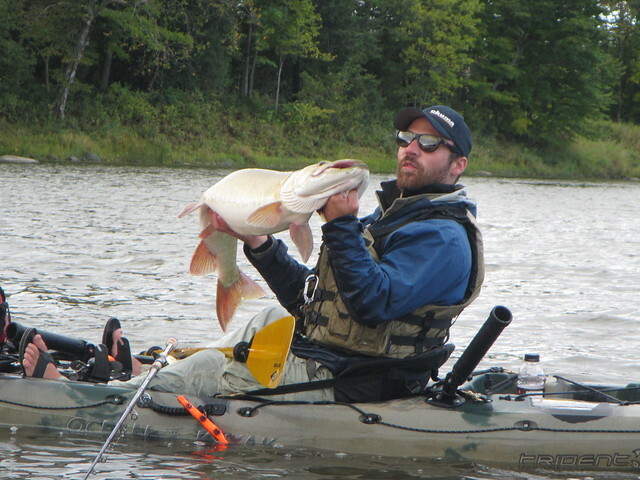 Part two of our trip, a visit to a secret lake near Maniwaki Quebec, will be posted next week. How is this for crazy. 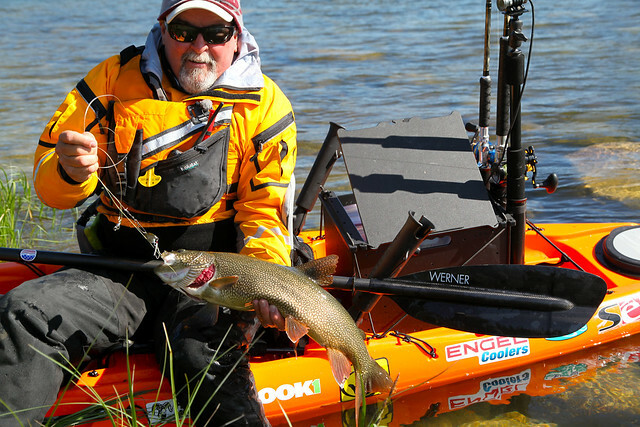 Besides our normal distribution in the US and Canada on WFN and NBC sports The Kayak Fishing Show with Jim Sammons will now be available in Italy, Spain, Bahrain, Egypt, Iraq, Jordan, Kuwait, Lebanon, Oman, Qatar, Saudi Arabia, Syria, UAE, Yemen, Sudan, Libya, Algeria, Chad, Djibouti, Morocco, Tunisia, Somalia Mauritania. Hungary, Romania, Moldavia, Serbia, Croatia, Montenegro, Slovakia, Czech Republic, Bulgaria, Russia, and we are in the works with Japan and China. Now if only we could get Cox cable to carry it in San Diego. Amazing to think of how this sport has grown since I started so many years ago, and how it has really exploded over the past five years. Thanks everyone for watching and for helping us spread the word on the sport we love.